The Danish manufacturer Gubi of Copenhagen produces the legendary lamps of the British designer Robert Dudley Best since 2004. 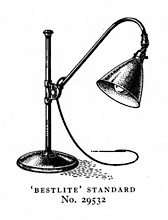 Bestlite developed of the most revolutionary changes in the period from 1918 until 1933. The period known as Bauhaus sought to break down the barriers between the practical crafts, industrialisation and fine art. Designs from the era brought functionality and simplicity to the forefront, displacing all superficial ornamentation. Bauhaus is a rebellion against tradition, and is the school and style that has had the greatest influence on design in the 20th century. Robert Dudley Best designed Bestlite in 1930. His studies as an industrial designer brought Best to Paris and Düsseldorf where he drew the first drafts of the lamp that would later become synonymous with his name. As the lamp was the first example of Bauhaus in the UK, strong arguments were needed before the lamp could be put into production. The lamp was produced by the manufacturing firm Best & Lloyd, founded by Best’s family in 1840. After mention in the prominent architectural magazine Architects’ Journal, the architectural community opened its eyes to the lamp’s potential. Bestlite gained everlasting fame when Winston Churchill placed one on his desk in Whitehall. In 2004, the Danish design firm GU BI took over the international rights for the Bestlite collection: When Gubi Olsen travelled to England in 1989, he found the production factory of the Best lamps – Best&Lloyd – in a sad state. The company was about to break and the money wasn’t enough, even for packaging material, which is why the lamps were sold coated in newspapers. The lamps have already been designed in 1930 by Robert Dudley Best, who studied in Dessau and cared about contacts with the Bauhaus school in Dessau. During the first years, the Best lamps were especially used in car-garages and even in the hangar of the Royal Air-Force, since they are very movable and could be adjusted in the most different directions, ensuring continuously optimized light. Also the twice British Prime Minister Winston Churchill knew about the Best-lamps’ quality and had a specimen on his desk in Whitehall. Here the Best lamps also gained huge popularity and especially architects and designers like them as working lights. Robert Dudley Best Robert Dudley Best (1892-1984) studied at the Düsseldorf School for Industrial Design and later on at the Furniture Atelier in Paris. 1930 he designed his revolutionary lamp in the Bauhaus style and counts to the most famous British designers since then.